onLoad="if ('Navigator' == navigator.appName) document.forms.reset();"
Peter is a red mackerel tabby and white male from our friend Sherry Campbell (Mainesuspect cattery) in Maryland. 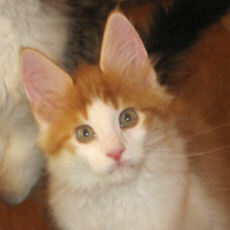 His parents are NW, GC Tropikoons Hang Ten of Mainesuspect and CH Sarajen Sazerac of Mainesuspect. HEART: Normal as of 1 year of age, checked by Dr. J Woodfield. Pedigree: Peter is out of Ten and Sassy. 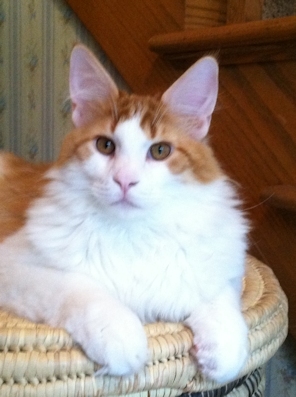 Peter is a red mackerel tabby and white male from Mainesuspect cattery in Maryland. He is the sweetest chunk of a fellow, all purrs and snuggles. We love his expression, his gorgeous head, muzzle, chin and profile, and his heavy boning -- and his temperament (did we mention all that purring?). 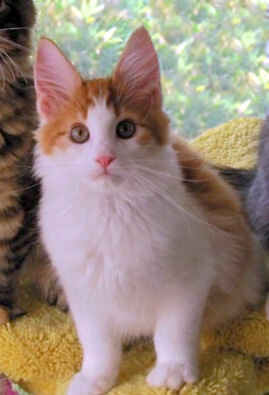 His coloring is a deep intense red (unusual for a red mackerel tabby) and the high white makes him even flashier.